Archaic Communication Devices in Healthcare: Pagers Still Used in Hospitals? 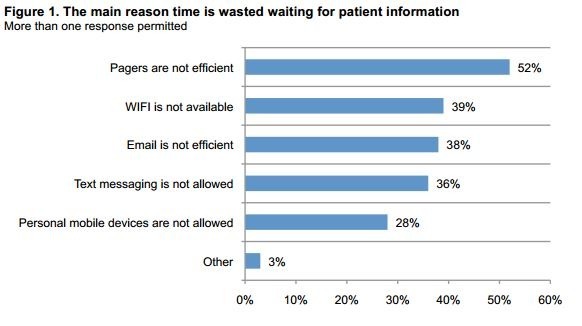 “Clinicians’ time wasted due to outdated communications technologies can cost the healthcare industry more than $5.1 billion annually” (Ponemon Institute© Research Report, 4). communication between physicians, technicians and other clinical hospital personnel: a practice that is costing hospitals an estimated $8.3 Billion per year, according to some sources. Digital communications must include some form of user identification, encryption and an automatic logoff to prevent unauthorized access to a patient’s information. Pagers are still the status-quo in hospitals because that technology is still the proven path to ensuring that doctors and nurses are in compliance with the law (Kavilanz, CNN Money May 7, 2013). “[D]octors say they spend only about 45 percent of their time actually interfacing with patients, in large part because they must deal with inefficient communications technologies such as pagers,” Larry Ponemon, founder of Ponemon said in a statement given about the findings. Secure text messaging may take the place of pagers within the next few years, participants hope. With the advent of the mHealth movement, and a plethora of healthcare apps, personal, or employer-issued smart devices may finally take the place of these pagers. Such a move would increase communication rates between hospital healthcare providers that may translate into up to 50 minutes saved per patient. But, as healthcare is a very heavily regulated industry, slower to adopt more current conventions, the adoption can’t come soon enough.